To honor our troops for this year, I am going to share this story about their mettle. What follows are excerpts from remarks by Marine Lt. Gen. John F. Kelly made to the Semper Fi Society of St. Louis on November 13, 2010. While leading his platoon on a combat patrol, Kelly’s son, Marine 1st Lt. Robert Michael Kelly, had been killed in action four days earlier in Sangin, in southern Afghanistan. Lt. Kelly was only 29-years-old. “Those with less of a sense of service to the nation never understand it when men and women of character step forward to look danger and adversity straight in the eye, refusing to blink, or give ground, even to their own deaths… No, they are not victims but are warriors, your warriors, and warriors are never victims regardless of how and where they fall. Death, or fear of death, has no power over them. Their paths are paved by sacrifice, sacrifices they gladly make… for you…. “Two years ago when I was the commander of all U.S. and Iraqi forces, in fact, the 22nd of April 2008, two Marine infantry battalions, 1/9 ‘The Walking Dead,’ and 2/8 were switching out in Ramadi… Two Marines, Corporal Jonathan Yale and Lance Corporal Jordan Haerter, 22 and 20 years old respectively, one from each battalion, were assuming the watch together at the entrance gate of an outpost that contained a makeshift barracks housing 50 Marines… Yale was a dirt poor mixed-race kid from Virginia with a wife and daughter, and a mother and sister who lived with him and he supported as well. He did this on a yearly salary of less than $23,000. Haerter, on the other hand, was a middle-class white kid from Long Island. They were from two completely different worlds… But they were Marines, combat Marines, forged in the same crucible of Marine training, and because of this bond they were brothers as close, or closer, than if they were born of the same woman. “The mission orders they received from the sergeant squad leader I am sure went something like: ‘Okay you two clowns, stand this post and let no unauthorized personnel or vehicles pass. You clear?’ I am also sure Yale and Haerter then rolled their eyes and said in unison something like: ‘Yes, Sergeant,’ with just enough attitude that made the point without saying the words, ‘No kidding sweetheart, we know what we’re doing.’ They then relieved two other Marines on watch and took up their post at the entry control point of Joint Security Station Nasser, in the Sophia section of Ramadi, al Anbar, Iraq. “What we didn’t know at the time, and only learned a couple of days later after I wrote a summary and submitted both Yale and Haerter for posthumous Navy Crosses, was that one of our security cameras, damaged initially in the blast, recorded some of the suicide attack. It happened exactly as [Iraqi policemen on the scene] had described it. It took exactly six seconds from when the truck entered the alley until it detonated. “You can watch the last six seconds of their young lives. Putting myself in their heads I supposed it took about a second for the two Marines to separately come to the same conclusion about what was going on once the truck came into their view at the far end of the alley. Exactly no time to talk it over or call the sergeant to ask what they should do. Only enough time to take half an instant and think about what the sergeant told them to do only a few minutes before: ‘Let no unauthorized personnel or vehicles pass.’ The two Marines had about five seconds left to live. “It took maybe another two seconds for them to present their weapons, take aim, and open up. By this time the truck was halfway through the barriers and gaining speed the whole time. Here, the recording shows a number of Iraqi police, some of whom had fired their AKs, now scattering like the normal and rational men they were–some running right past the Marines. They had three seconds left to live. “For about two seconds more, the recording shows the Marines’ weapons firing nonstop… the truck’s windshield exploding into shards of glass as their rounds take it apart and tore into the body of the son-of-a-beech who is trying to get past them to kill their brothers–American and Iraqi–bedded down in the barracks, totally unaware of the fact that their lives at that moment depended entirely on two Marines standing their ground. If they had been aware, they would have known they were safe… because two Marines stood between them and a crazed suicide bomber. The recording shows the truck careening to a stop immediately in front of the two Marines. In all of the instantaneous violence Yale and Haerter never hesitated. By all reports and by the recording, they never stepped back. They never even started to step aside. They never even shifted their weight. With their feet spread shoulder-width apart, they leaned into the danger, firing as fast as they could work their weapons. They had only one second left to live. Tales like this are legion in the annuls of the military history of the United States of America. Our citizen soldiers are some of the best ever seen by mankind. This Memorial Day, please do remember them, pray for them, support them. 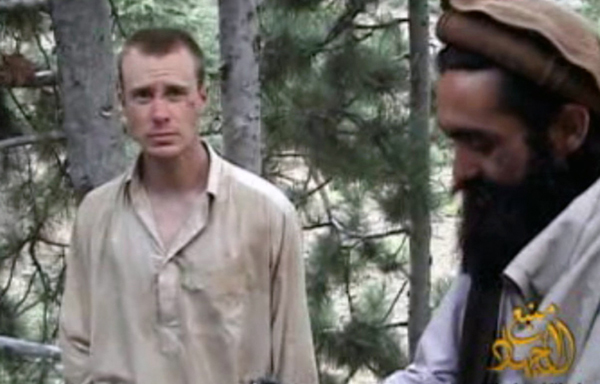 UPDATED: Questions on Bergdahl POW Release: Dad a Muslim Symp? Soldier Deserted? Obama’s Actions Illegal?